Known for its high content of B vitamins, proteins and minerals, Brewer’s Yeast is saturated with nutrients essential to growth, development, and long-lasting vigor. Many have missed out on the nutritional advantages of brewer’s yeast due to its strong unusual flavor. NOW Brewer’s Yeast in convenient tablets makes it easier than ever to reap the benefits of this highly nutritious product. Used often to encourage the production of enzymes and aid the digestive system, NOW Brewer’s Yeast Tabs are safe, convenient and abundantly nutritious. 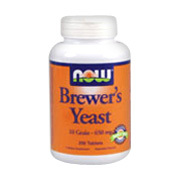 Brewer's Yeast contains several naturally occurring vitamins, minerals, and other beneficial nutrients. All vitamins listed occur naturally in Brewer's Yeast. No synthetic vitamins were added to the yeast during processing. As a dietary supplement, take 3 tablets 3 times daily with meals. Free of: sugar, salt, starch, wheat, gluten, corn, soy, milk, egg or preservatives. Brewer's Yeast 10 GR is shipped in a discrete, unmarked package. Orders are processed immediately and usually take about 3 to 5 working days to be received. Any information received is used only for order processing and shipping purposes. Your information, such as e-mail address, will never be disclosed to a third party. BREWERS YEAST 10 GR - is shipped in a discrete, unmarked package. Orders are processed immediately and usually take about 3 to 5 working days to be received. We do ask that you try it for 2 to 3 weeks to feel the full effects. Any information received is used only for order processing and shipping purposes. Your information, such as e-mail address, will never be disclosed to a third party.